A Retreat with Dennis Hamm, S.J. The Bishops’ Synod on the Bible: What Happened? 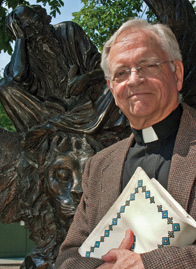 Father Dennis Hamm, a priest of the Society of Jesus since 1970, is professor of theology at Creighton University, where he taught Scripture for 33 years and, since 2004, holds the Graff Faculty Chair of Catholic Theology. He earned several advanced degrees from major universities, was a Fellow at Yale School of Divinity (1973-75), a researcher at the Pontifical Biblical Institute, Rome (1985-86), a worker on the Bethsaida dig in Israel (summer of 1988), a scholar-in-residence at the Ecumenical Institute for Culture Research, Collegeville (1994-95), and most recently at the Tantur Ecumenical Institute, Jerusalem, Israel (2001-2002). Father Hamm has published widely in scholarly journals. He is a member of the Catholic Biblical Association, the Society of Biblical Literature, the College Theology Society, and Pax Christi. Fr. Hamm's articles have appeared in Biblica, The Catholic Biblical Quarterly, The Journal for the Study of the New Testament, The Way, The Bible Today, Church, Fellowship, America, and in reference works such as The Anchor Bible Dictionary, The New Catholic Encyclopedia, and The Collegeville Pastoral Dictionary of the Bible. He is an expert on the Gospel of Luke and has written four books and more than a hundred articles on topics relating to the New Testament and its implications for Jewish-Christian relations. He is also a coeditor, along with Leonard Greenspoon and Bryan J. LeBeau, of The Historical Jesus through Catholic and Jewish Eyes. Downloading the Audio Retreat Conferences as MP3 files. The Conferences of this retreat are in the MP3 file format. They can be listened to at the computer by clicking on the link to the left. The individual mp3 files can be downloaded and can be listened to on a computer, without being connected to the internet (expecially helpful for a slowly or more costly connection. The files may also be copied to an mp3 player. Finally, the files can be burned to a CD to be played on a CD player, in a car or a portible device. To download a Conference, place your cursor over the name of the Conference and hold down the RIGHT mouse button. Select "Save Link As ..." and chose where to save the file on your computer, or to save it directly to a media player or card attached to your computer. If they are copied as "DATA" they will remain as mp3 files and will pay on any CD player that plays mp3 files (and in most newer car CD players). All the files will easily fit on one CD. This is also the best option to use to send the files to someone else or if you intend to use this CD to copy the files to another computer or device. If the files are copied as "MUSIC" they will be converted into higher quality CD media files, which will play on any CD player (and older model car CDs). Only two files will fit on each CD in this format.